An enduring, and sustainable, Hawaiian tradition. 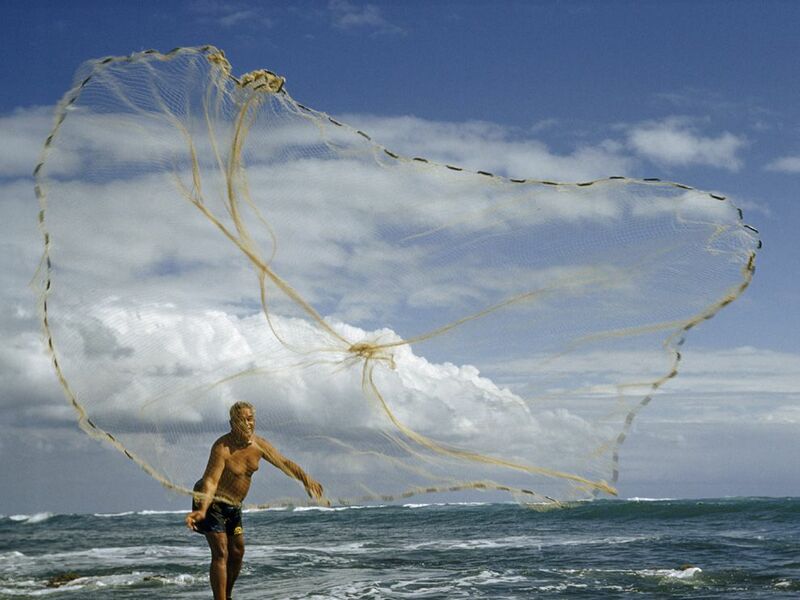 A Hawaiian fisherman uses a cast net. A cast net is usually small enough to be operated by one person. It is round or oval, and can be thrown, or cast, over a large area. Weights on the side of the net help it sink, catching any sea creatures inside. Cast-net fishing is one of the more sustainable methods of recreational or sport fishing. A cast net is usually small enough to be operated by one person. It is round or oval, and can be thrown, or cast, over a large area. Weights on the side of the net help it sink, catching any sea creatures inside. Cast nets are one of the oldest and most efficient ways to catch large amounts of small- to medium-sized fish. The ancient Polynesians who first settled Hawaii between the 4th and 9th centuries probably brought the skills and technology of cast-net fishing with them. This fisherman is using a large cast net. A fisherman would need to be very strong and have a good sense of balance to fish with this net. The weights on the net (visible as dark rods along the edge) probably weight about 5-7 kilograms (11-15 pounds). Filled with squirming fish, its weight could exceed 45 kilograms (100 pounds). There are few regulations restricting non-commercial use of cast nets in the nearshore, coral reef fishery of Hawaii. Strict regulations prohibit many types of cast-net fishing in deeper water. Akule (yellowtail scad), menpachi (soldierfish), parrotfish, and goatfish (sometimes called red mullet) are popular fish caught with cast nets near the coast of Hawaii.